This is a fun one. 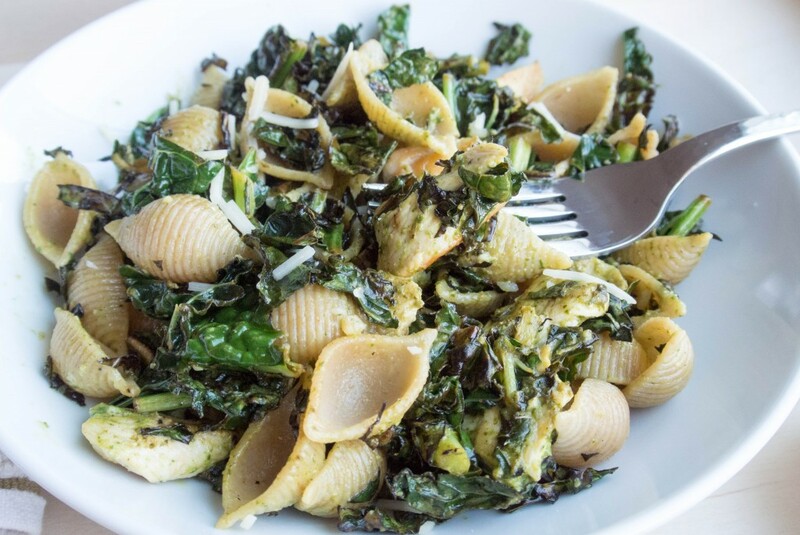 I have had “caesar” on the brain, and this easy weeknight pasta-dish-for-one delivers. In the time you boil water and cook the pasta, the rest of the dish is easily prepped. 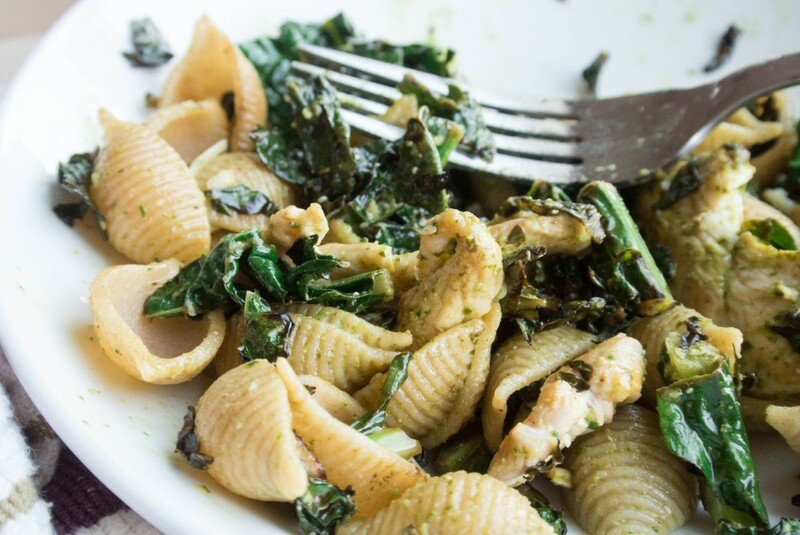 Shells + Chicken + Kale + Caesar = YUM. Make that caesar a spinach-caesar-dressing-sauce – which is the only way you can really describe it – and you have me wondering how this combo has not crossed my stove top before. You also have me wondering why every dressing doesn’t have a handful of spinach blended in. Hidden veggies? Yes, please. While you bring your water to a boil, slice the chicken in to thin strips, and cook it in a non-stick pan; this will take two rounds to accomplish so the chicken can have room to sear and turn brown. At some point during the cooking, add some sliced garlic. While the chicken is cooking, slice the kale into thin strips. At some point in this process, the water will boil – add the pasta to the water and set the timer according to the instructions on the box. 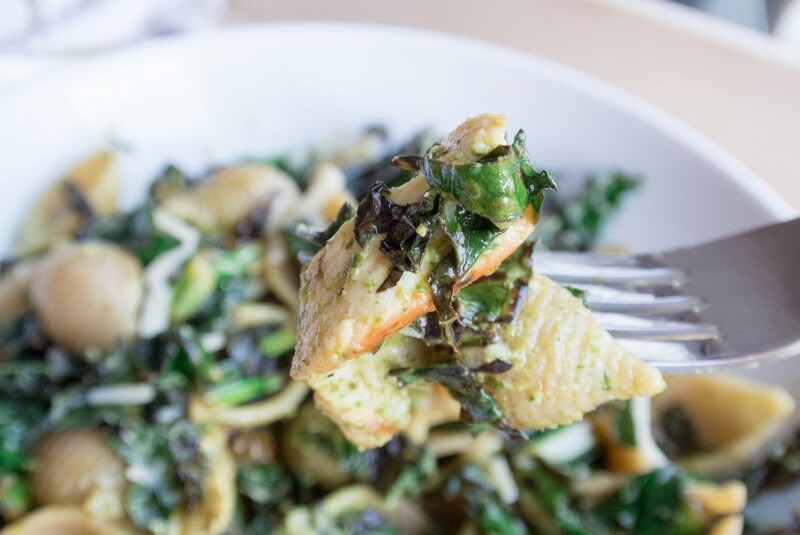 Remove the cooked chicken from the pan, heat a little extra virgin olive oil in it, and add the kale to the pan. Add a hit of lemon juice, and let the kale cook until it starts to brown. Turn off the heat but leave the pan on the warm burner so the kale can keep cooking, and char around the edges. Use this time to make the dressing in a mini-prep food processor. If you can make it in advance, all the better! Drain the pasta when it’s ready, and combine all the parts! 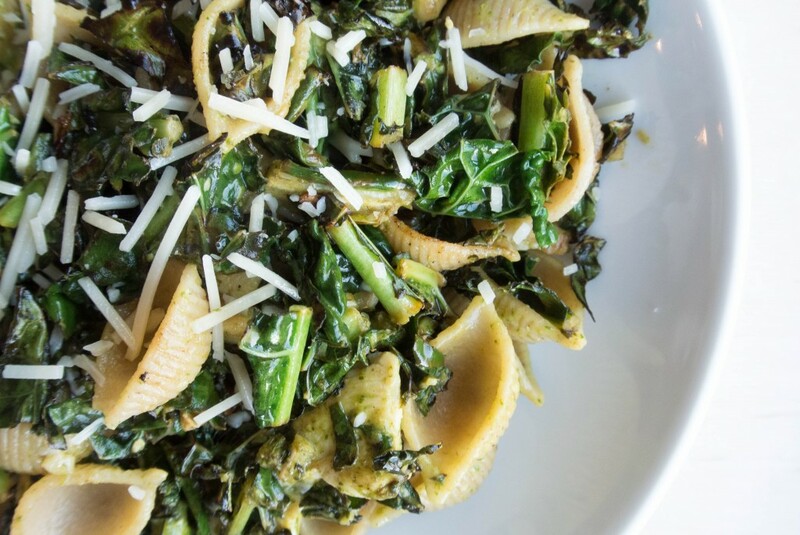 Add to the pan with the kale. Add a bit of dressing to heat it through, and have some parmesan cheese and extra dressing nearby for dinner time! Weeknight efficiency at its best. 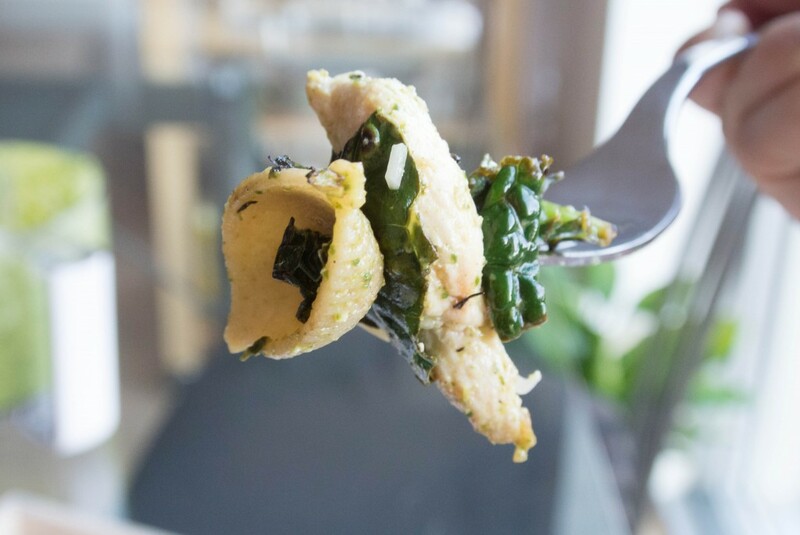 Shells + Chicken + Kale + Spinach Caesar = YUM. Bring water for the pasta to a boil. When it boils, add the pasta, and set the timer according to the instructions on the box or bag. Slice the chicken in to thin strips. Heat a large skillet or saute pan over medium-high heat. Add half of the chicken and space it out in the pan. Let it cook without messing with it for a few minutes, until the white cooked part stretches over half of the chicken. Flip the chicken strips over and add one clove of sliced garlic. Repeat with the second batch of chicken. When the chicken is done cooking, remove it from the pan, add a bit more oil, heat the oil, and add the kale to the pan (after you heat a little extra virgin olive oil in it). Stir to coat and saute for a few minutes. Add 1 to 2 T of lemon juice, and let the kale cook until it starts to brown. Turn off the heat but leave the pan on the warm burner so the kale can keep cooking, and char a bit around the edges. Use this time while the pasta is finishing up to make the dressing in a mini-prep food processor. Add 1 T lemon juice, the dijon mustard, and garlic. Pulse until combined. Stream in some oil through the little holes in the top, and when you have some volume in the dressing, add the spinach and some cheese. Put the top back on, continue to process, and add more oil as needed. You may want to add some salt, but I don't find that I need it. 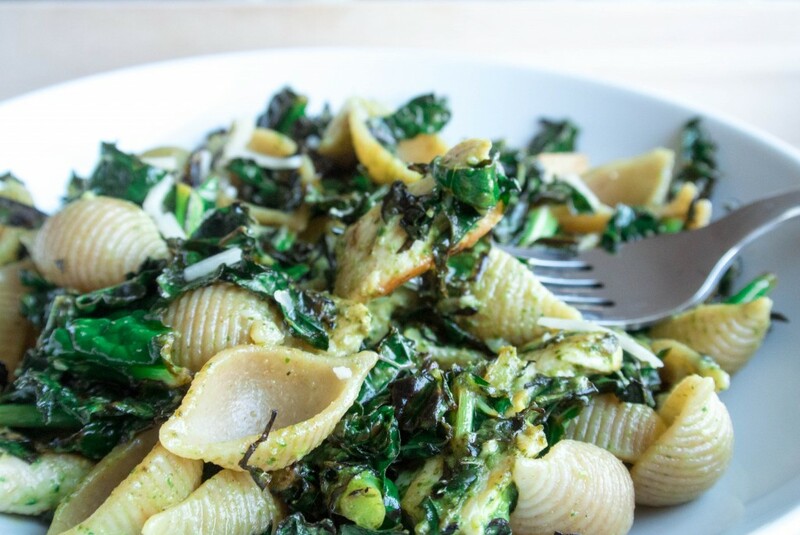 If you are making this a vegetarian dish and omitting the chicken, just add the garlic to the kale-cooking stage.